Wow, first off: what a great honor! Ever since I started this hobby I have hoped to one day achieve "Tank of the Month" (TOTM), but never in my wildest dreams did I think it would actually happen! 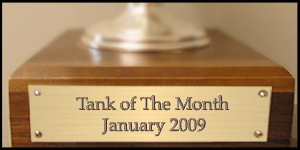 The first thing I began doing when I began designing my system was to read all the "Tank Of The Month" articles taking notes, comparing the tanks, and designing my system after them. Before going any further I would like to thank all those lucky enough to be past TOTM's. I'm grateful for the wisdom and experiences they have shared in this great and rewarding hobby of ours that ultimately has influenced and inspired so many of us. I have always loved the water. While growing up, my family had a boat we would take out on the weekends, and I remember the occasional extended boating trips that really helped to develop my passion for this hobby. 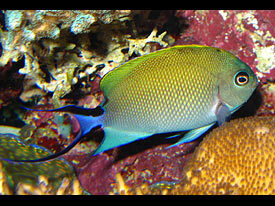 As a boy I remember snorkeling in the Florida Keys at John Pennecamp Coral Reef State Park. I can still remember how I felt when I saw the sun beaming through the crystal clear water onto the white sandy bottom of the ocean floor. I was in awe of the beauty of that coral reef teeming with all the fish but it was too bad I could not fully enjoy it because I was petrified of sharks! 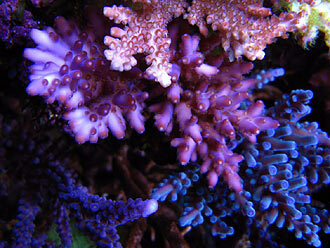 Now I have a real live coral reef in my living room without having to worry about sharks. One should not be so blessed! I have never enjoyed a hobby more than this one. 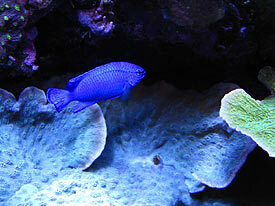 January 2009 marks the four year birthday of my display tank. 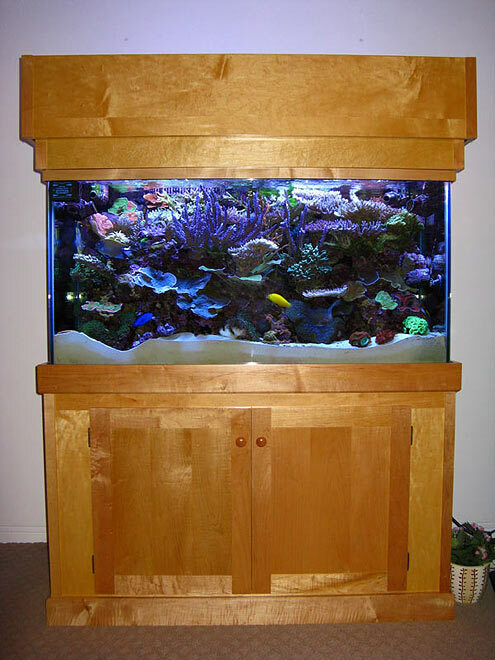 My tank is a 90-gallon “All Glass Aquarium”, which measures 48" x 18" x 24" with a single overflow. 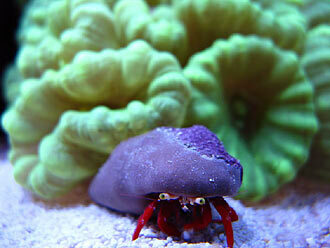 The display tank has about 150-pounds of Tonga live rock and about four to five inches of sand. The tank is plumbed through the wall directly behind the tank, which leads to the garage. 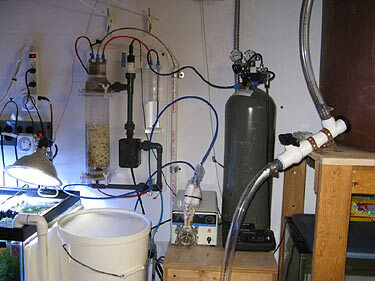 A section of the garage is dedicated to holding equipment and houses a 40-gallon prop and refugium tank, return pump, chiller, and calcium reactor. I built the stand and canopy out of maple, and worked on it a little bit every day over the course of three or four months. 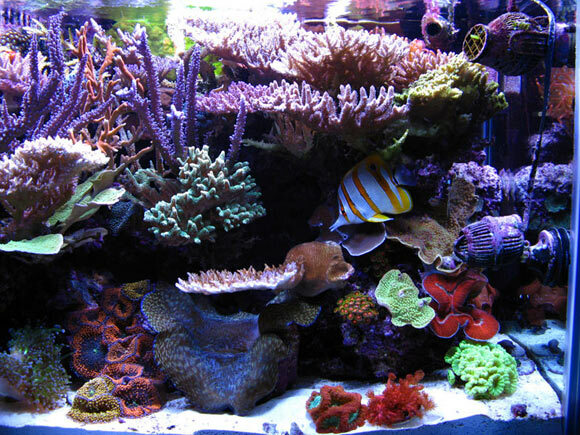 While slowly building the stand, I also invested time reading up on Reef Central; learning what to do, and what not to do. I was in no big hurry to get the stand completed because there was so much to learn. I designed the stand in keeping with Shaker-style furniture. I especially love the simplicity of Shaker design, which they say never goes out of style; a big bonus in my book. The canopy was designed to flip back onto itself, so I can easily get my arms in the tank as needed for maintenance and coral husbandry. Other Equipment: Tunze Osmolator with Tunze Calcium Dispenser. 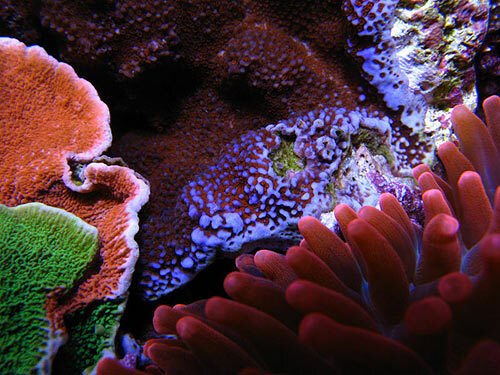 I believe lighting (photo period) is probably one of the most important aspects in reef keeping, as far as coral color and growth is concerned. 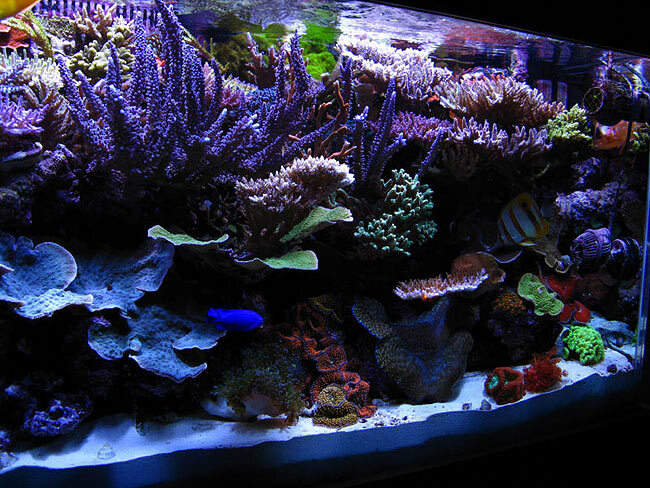 In my opinion, most people light their tanks too much by providing too long of a photo period; especially when using 10,000K bulbs. 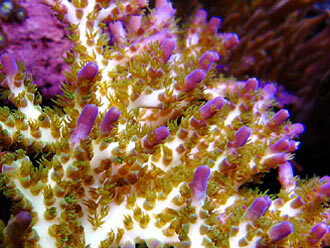 Through my experiences I've discovered that it's better to give your corals too little light than too much because unfortunately, too much light slows growth and results in a reduction of color. 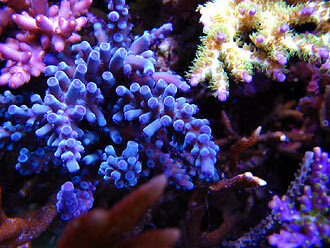 The corals in my display tank were grown from frags with a six hour-per-day photo period under metal halide lighting. When the metal halides are off, I run power compacts (10,000K) and actinic supplementation, so I can view the tank during the day. 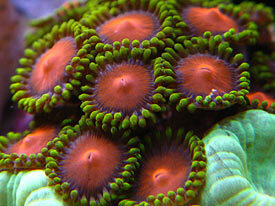 With this arrangement I have found coral growth to be consistent and rapid enough that I need to frag my colonies frequently. 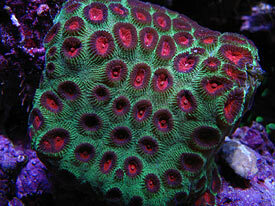 In my experience, I don't believe the power compacts themselves have really done much in terms of coral growth but I enjoy them for viewing purposes. I use a Hamilton light fixture with a Hammer Tone reflector. 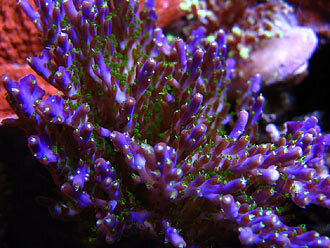 As I mentioned, I grew all my corals from frags, so I've seen first-hand through trial and error, how lighting can affect color and growth. 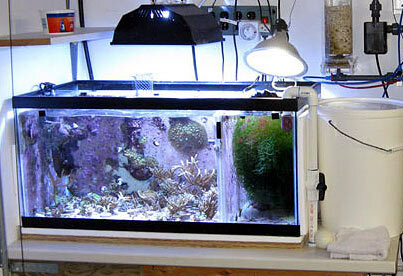 The first year this tank was set up I ran two 250-watt 10,000K Hamilton bulbs on six hour photoperiods. These bulbs were a very bright white and while running them I learned how damaging these white bulbs can be with too long of a photo period. 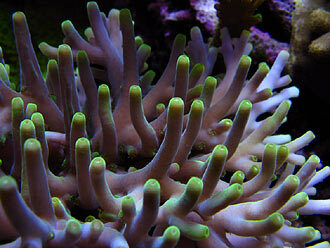 I tried using them for a seven hour photo period but found it was just too much for some of the corals. 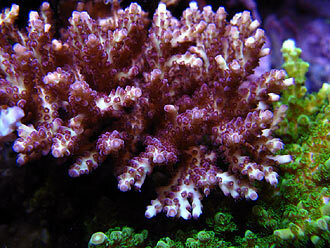 The corals were not dying off but they had noticeably slower growth and were beginning to bleach (lose color). 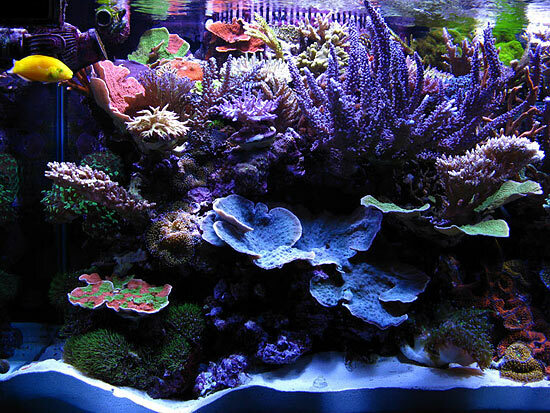 I then changed bulbs over to the 250-watt 14,000K Aquaconnects at the start of the tank's second year and used them up until the last couple of months. These bulbs are more like a 12,000K (white with just a hint of blue). 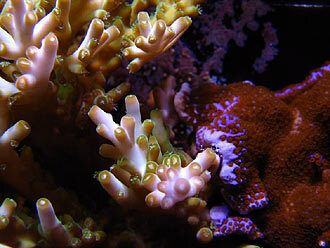 Although I really liked these bulbs, and the corals had great growth and fairly good color, they are expensive and need replacement about every nine months. All these bulbs were run on electronic ballasts. A few months ago I changed the lighting to two 250-watt 20,000K Radiums which are driven by PFO HQI (m80) ballasts. It has been eight weeks now and so far I like the results I'm getting with these bulbs. 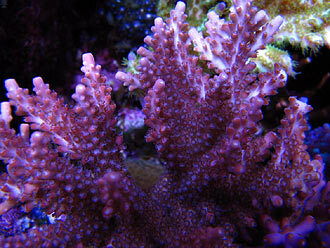 To adapt the corals to the new lighting, I dropped the photo period down to four hours for the first week. Then, starting on the second week I increased the photo period to five hours per day. I'm currently running these bulbs for six hours each day and am considering increasing to seven hours a day. 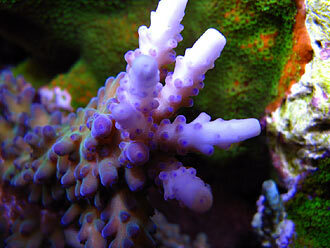 Because these bulbs are bluer than the previous Aquaconnects, a seven hour photo period should be easier on the corals over the previous bulbs. So far I'm pleased with the results of these Radiums. 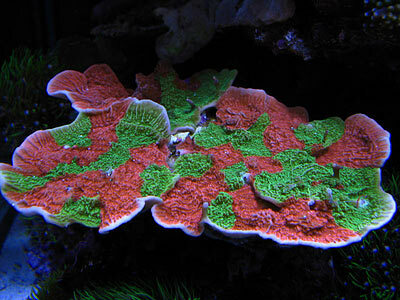 Not only does the growth seem to be just as good, but I'm already seeing improved color. One consideration I had before changing to the Radiums was the possibility of the bulbs looking too blue (since really blue tanks are not my personal preference), but driving them with the HQI ballasts they have a crisp whitish blue look. 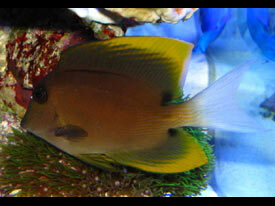 That seems to be the consensus of everyone who has seen my tank recently. 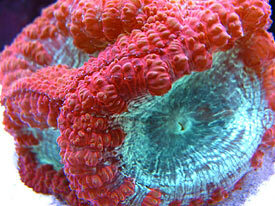 I have found a key component of growing quality corals is keeping alkalinity (alk) stable. 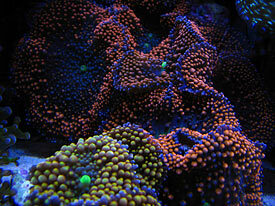 If you are new to the hobby and are considering keeping SPS corals, I can not stress the importance of this aspect enough. 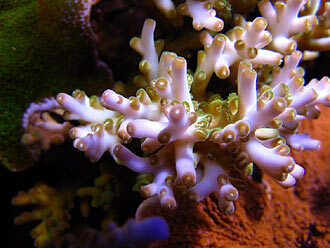 I feel my system is unique because I have very little water volume compared to the ratio of SPS corals. Therefore, it is crucial for me to keep a close watch on my alkalinity. In fact to ensure stability, I test alkalinity daily. I once had my calcium reactor go offline for five hours and my alk dropped from 3.5 meq to 3.0 meq. Currently I'm running a Schuran Jetstream 1 reactor that I am very pleased with, although I believe it is undersized for this system. One aspect of water quality that I employ is using two bags of carbon in the bubble trap of the sump with no filter socks. Every two weeks I change out one of the used bags with fresh carbon. I also run 130-grams of Phosban in a Phosban Reactor and change it out every two months. I've found that if I go longer than two months my phosphates start to creep up, so I make it point to stay on that schedule. 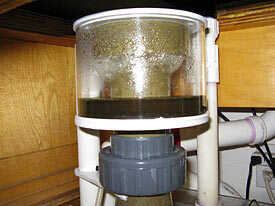 I recently changed my protein skimmer to a custom cone, and I'm very happy with the performance of it. I've used Instant Ocean salt from day one and since it's worked well for me, I haven't tried anything else because I feel that if it isn't broken, don't fix it! 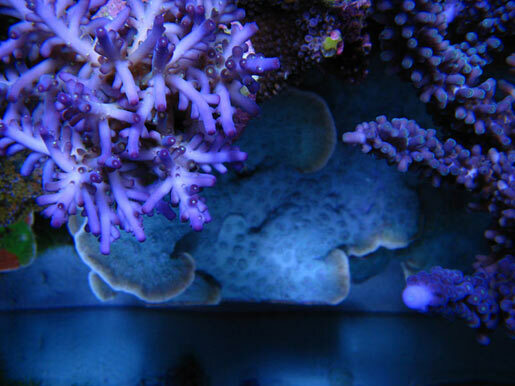 Through my experiences, I believe consistency is a big part of helping corals thrive and grow, so I try to never change anything on my system unnecessarily. 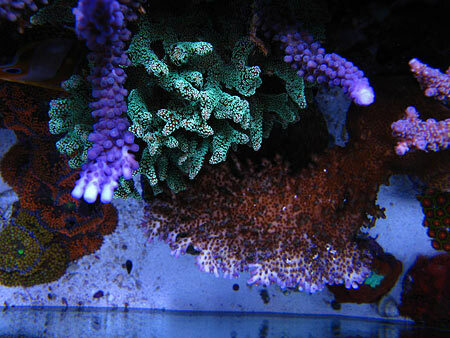 I guess you could consider my reef keeping style pretty old school, since I don't dose or add any supplements or chemicals to the tank. I prefer to stay with tried and true methods. I typically do a ten-percent water change every week but lately I have to admit to not keeping on schedule like I should. 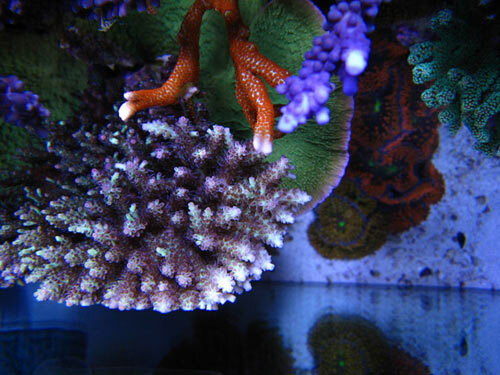 When the tank was two and a half years old I started noticing some of my SPS corals were not looking their best and a couple of colonies even started to die off. After doing some water testing I found to my disbelief, that my nitrates had jumped to 15 in a matter of months. During that time my big ORA Blue Tort stopped growing. In fact, it still bears the residual effects of that because some branches are thin and stunted right in the middle. It was that experience that prompted me to add a 40 gallon propagation tank with a built in refugium with chaetomorpha (cheato) macro algae. 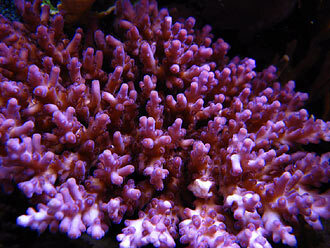 Interestingly, within three weeks after adding the chaeto, my nitrates were back down to near zero! 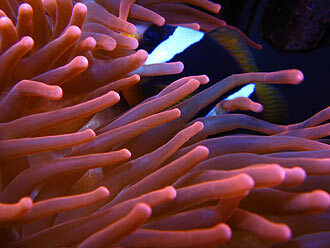 For that reason, I think the chaeto was one of the best things I have ever added to the tank. There is much more flow at the top of my tank then at the bottom. 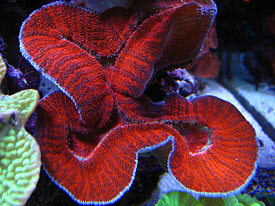 I love the Sea Swirls; I have never needed to touch them in the four years the tank has been running. 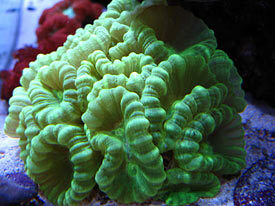 They give the tank a nice random flow and are easy to plumb. 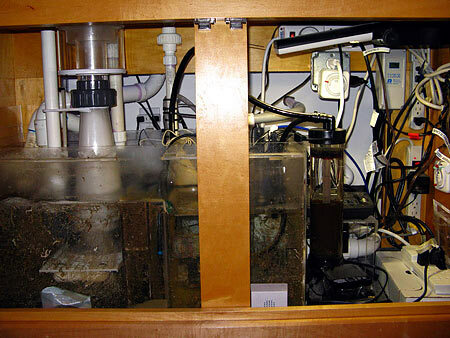 For my next tank I'm probably going to use exclusively Sea Swirls with flow accelerators because I really hate cleaning the power heads and prefer to make things as simple and maintenance free as possible. 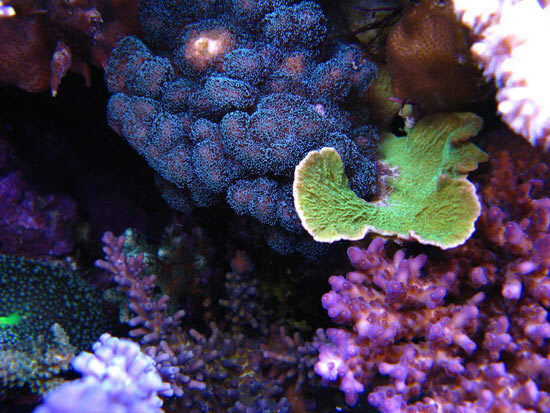 In my estimation, I would say I don't have a large amount of flow in my tank like other SPS dominate tanks that I've seen, but my corals have always done well with the flow I have and my LPSs are happier with the lower flow. 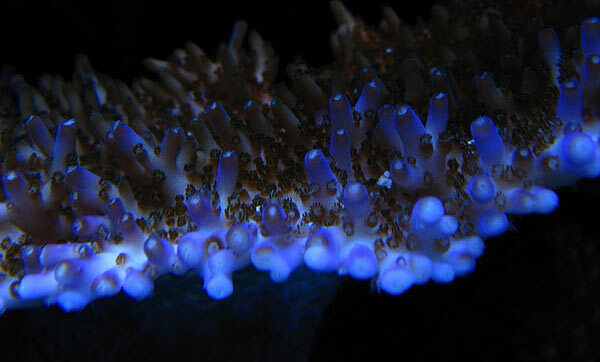 At one point I tried adding more flow but found that my hammer coral and frogspawn coral would not open up fully, so I switched back to my original amount of flow. 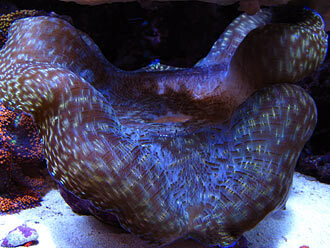 I believe my clam appreciates the lower flow too. 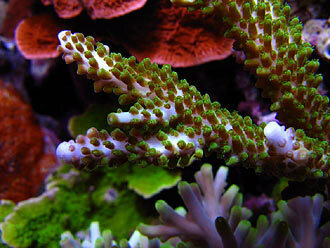 Glue various colored Montipora frags on to a disk, and watch the results grow in like Emmett did. Great idea! 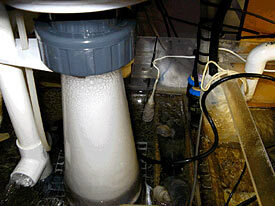 I clean the protein skimmer, do a water change, and refill the calcium dispenser and top off bucket weekly. 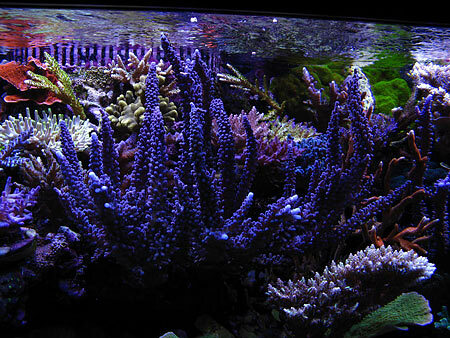 I also clean the glass with a Mag Float daily since doing so helps reduce scraping time and keeps the corals from touching the front glass. 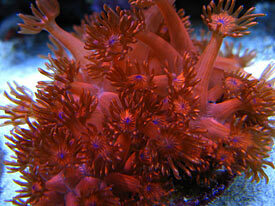 I stir the sand bed in the front of the tank once a month to keep it nice and white looking. 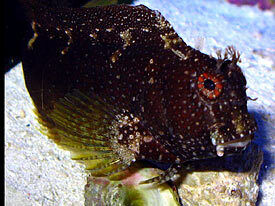 I feed a mixture of flake and PE Mysis once every day. 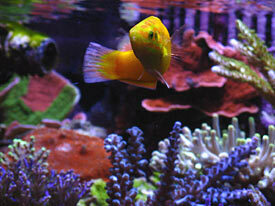 I don't feed more than what my fish can consume within three minutes. I used to add Cyclop-Eeze with the feedings but since discontinuing it I've not noticed any appreciable difference. 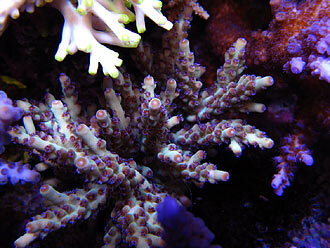 I consider my tank to be a mixed reef, although it is set up more for the sake of SPS type of corals. 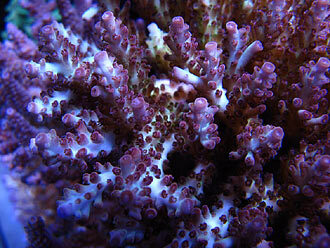 SPS is my favorite type of coral, but I do love my LPS and Softies. 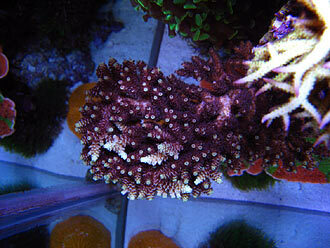 I've placed most of the SPS corals near the top of the tank where they can get the most light and flow. The LPSs and Softies are always surprising me with how well they can do with very little light on the bottom and sides of the tank. 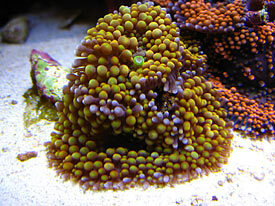 One more thing I'd like to mention is that people find it hard to believe I have a Rose Bubble Tip Anemone in my tank. 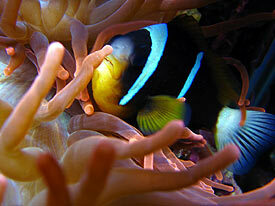 It is currently hosting the Clarkii clownfish. 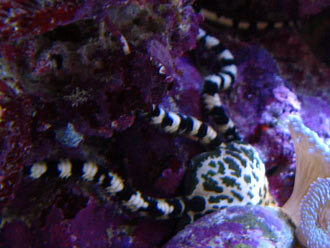 In the four years it's been in my tank I've never had a problem with it stinging the corals (at least to the point of death) or roaming around the tank. 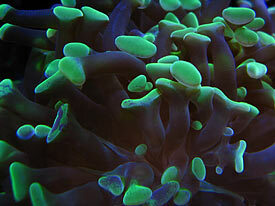 It is currently touching about six colonies and although it does sting the corals where there is constant contact, it doesn't kill the whole colony. 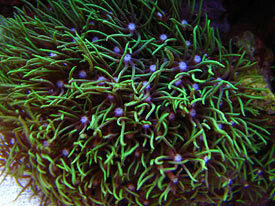 Since I've had the anemone, it has only split once, but I believe it will probably be splitting again soon since it has been getting quite large. 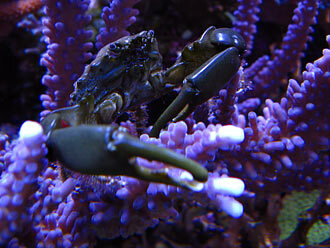 I don't generally feed him, but sometimes the Clarkii takes food up to him. 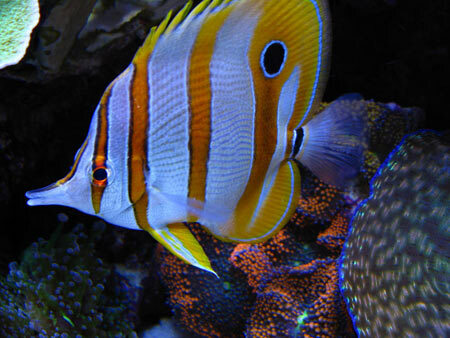 I would like to thank Reef Central and Reefkeeping Magazine for all their hard work and dedication in bringing the quality information we all need to keep healthy and beautiful reef tanks. 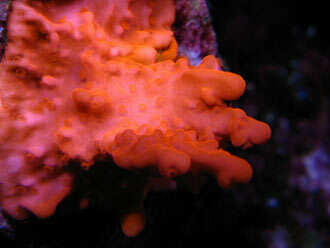 I'd also like to thank my friends at the Tampa Bay Reef Club who have given me such valuable and useful information. I've learned so much from all your posts and the discussions at the meetings. Thank you all for your support! 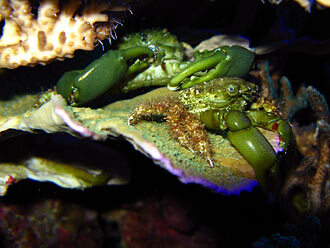 I would also like to thank Annette Baker and Alyse Figueredo for helping me put this article and pictures together. Their willingness to help in any way possible was a great inspiration to me.